The writer of the Mummy reboot promises it’ll be terrifying. Scarlett Johansson discusses being the star of Ghost in the Shell. A familiar face is returning to iZombie. Plus, casting for Jurassic World 2, new footage from Moana and Star Wars Rebels, and behind-the-scenes images from Rogue One. Spoilers now! I think [there is] a similar desire to legitimately explore the frightening and the cosmic. In The Mummy, I think we’re going to see the first Mummy film in the entire Universal canon with the true power to terrify. The earliest [Boris] Karloff and Bela Lugosi Mummy movies were scary in a small way, perhaps a dated way. They were almost parlor movies. Subsequent movies have been more swashbuckling. This one is going to have all of that action and adventure, but a legitimate power to terrify. I think that’s going to be the new experience of that film. Yeah, I mean, I think it clearly is setting up certain things. In the immediate future, being the movies, we’ve announced… I think those with knowledge of the comics may expect things that will not be happening in the movies. Those who don’t know what has happened in the comics will be shocked at what we do. But yeah, once that Gauntlet is on, as the poster of Doctor Strange says, “the impossibilities are endless.” How do you fight that? How can you defeat that? So we play into all of that. We play into all that stuff. I don’t know that we’ll get into Earth 1 thru 616 in any one moment anytime soon. Instagram user pchxhunters captured some photos during filming on the Paramount backlot. Head here to see more. Scarlett Johansson talks about the importance of playing a role like the Major in a new behind-the-scenes interview with ET. Hear another sample from the film’s musical soundtrack in a new clip exploring the role of Moana’s people as explorers and settlers. Here’s another new TV spot, featuring a few new snippets of footage. The cast and crew discuss the premise behind the franchise’s Assassin vs. Templar conflict in a new featurette. Watchers on the Wall has another set report from filming in the ruins of Italica, believed to be standing in for the Dragonpit in the show—offering new details about a scene featuring Lena Headey, Peter Dinklage, Emilia Clarke, Kit Harington, Iain Glen, Conleth Hill, Nathalie Emmanuel, Anton Lesser, Rory McCann, and Hafthor Bjornsson (phew, that’s a lot of cast!) filming a scene together. 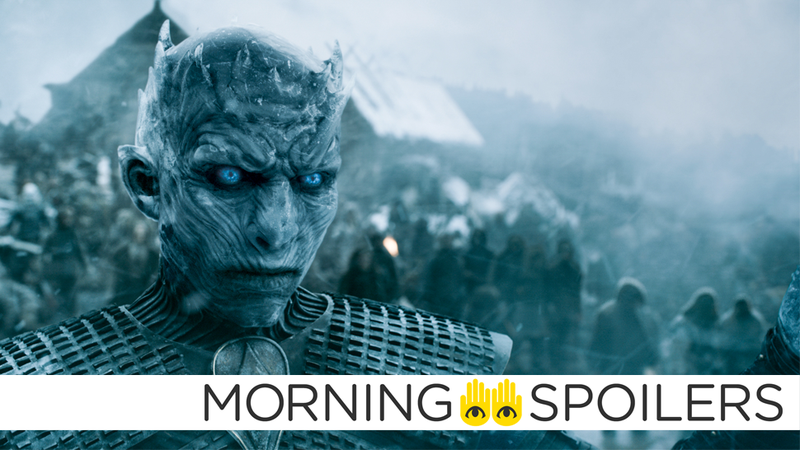 While the meeting of such a huge part of the cast is interesting enough, the report carries an even more intriguing tidbit: the scene allegedly sees someone unveil a wight to the stunned gathering, in an attempt to convince everyone of the impending and very real threat of the white walkers. No details on whether it’s meant to be a live wight or a dead one, but either way, it’s obviously part of what appears to be some of the climactic scenes for the next season. In the 10th episode of Season 3, Liv will eat the brains of a mentally disturbed man being haunted by the wife he killed in a car accident. By the rules of brain-eating, Liv will find herself similarly haunted. As the nation waits to hear the fate of the astronauts of Apollo 11, Flynn (Goran Višnjic) arrives near mission control, intending to rewrite the events of that momentous day. Hot on his trail, Lucy (Abigail Spencer), Wyatt (Matt Lanter), and Rufus (Malcolm Barrett ) need to be bolder than ever and call upon one of history’s unsung heroes if they’re going to have a shot at setting things right. With the gang trapped in detention and out of the way, Miss Quill accepts Dorothea’s astonishing offer: to help remove the Arn from her head, and to reclaim her freedom. Alongside Ballon, an imprisoned shape-shifter, Miss Quill travels in a metaphysical engine and is taken to impossible, extraordinary and dangerous worlds, collecting materials in preparation for her life-changing procedure. After an emotional encounter with her surgeon and a nearly-fatal operation, Miss Quill must find a way to return to Earth: transformed and ready for war.